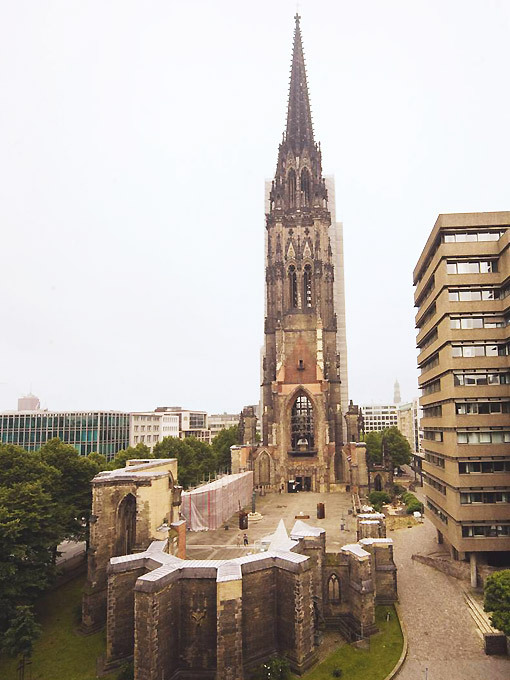 It was the spire of St. Nikolai which involuntarily initiated Hamburg’s decline and, oddly enough, survived destruction. It is a bitter paradox that almost a hundred years after the Great Fire this building, the highest in the city and built by an Englishman, served as a target for British bomber aircraft. 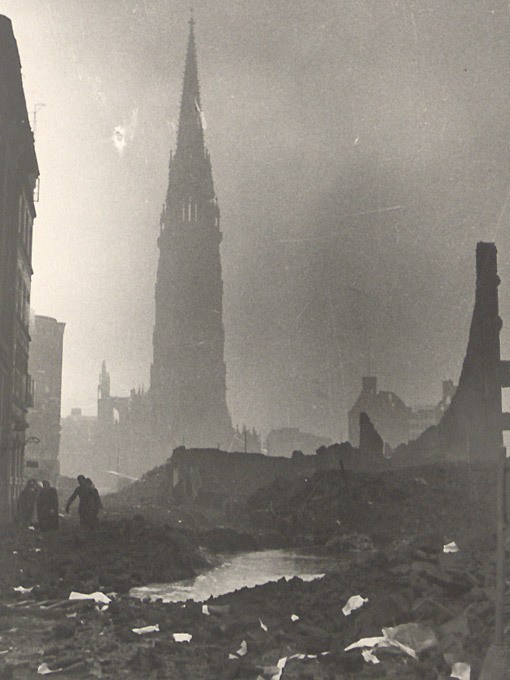 When they flew their night-time air raids on Hamburg, they chose the spire of St. Nikolai as a landmark. It was to be the heaviest bombardment of a German city so far and assumed an extent which for want of a better word was described as being of ‘biblical dimensions’. Consequently, it was dubbed Operation Gomorrah. Between 24 and 29 July 1943, the Royal Air Force flew five night-time air raids in massive waves which alternated with two daylight attacks by the US Air Force. To blind German radar the RAF first dropped tin foil strips. The population of Hamburg felt as if ‘fire and brimstone’ were raining from the sky – just as in Sodom and Gomorrah in biblical times. 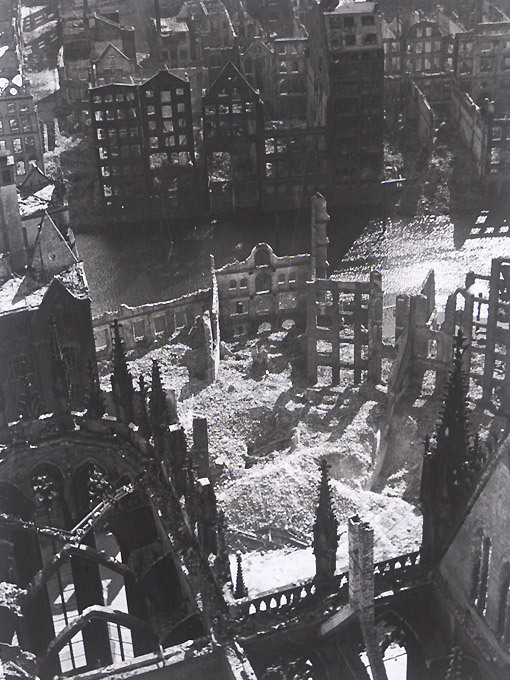 Then Allied bombers dropped a total of about 18,000 tonnes of bombs over the port, the inner city and large residential areas, especially the working class areas east of the Alster. However, it was not just the mere quantity, but the fatal combination of high explosives and incendiaries which resulted in unprecedented devastation. First ‘blockbusters’ were dropped which cracked open houses, then incendiaries containing phosphorus raised a firestorm which at times reached an altitude of 6,000 metres. The entire city turned into a volcano, a vent, a gigantic stack in which hurricane-like winds drew the hot air upwards causing low pressure on the ground which in turn sucked in oxygen, thus acting as an accelerant. About 34,000 people were killed in this firestorm; many burnt to death or suffocated within a few seconds. Approximately 40,000 buildings with 263,000 dwellings were destroyed, i.e. about half of all homes in Hamburg were annihilated. The eastern part of Hamburg, in particular, was one vast restricted zone. It is still hardly believable that the high slim spire of St. Nikolai could remain standing, while the better part of the nave was heavily damaged. When after the end of the war the citizens of Hamburg began to reconstruct their city, they wondered what to do with St. Nikolai. Curators of monuments had secured and sorted the rubble under the most difficult conditions. However, considerable resistance was put up to the reconstruction of this church. An authentic reconstruction, especially of the neo-Gothic hewn stone ornaments, was considered unaffordable and also unsatisfactory in terms of aestheticism and the preservation of historic buildings. For quite some time those responsible in the city government and the church dodged a decision. The parish council suggested that the ruin be used as a memorial. It was considered to build a small chapel in the open choir. 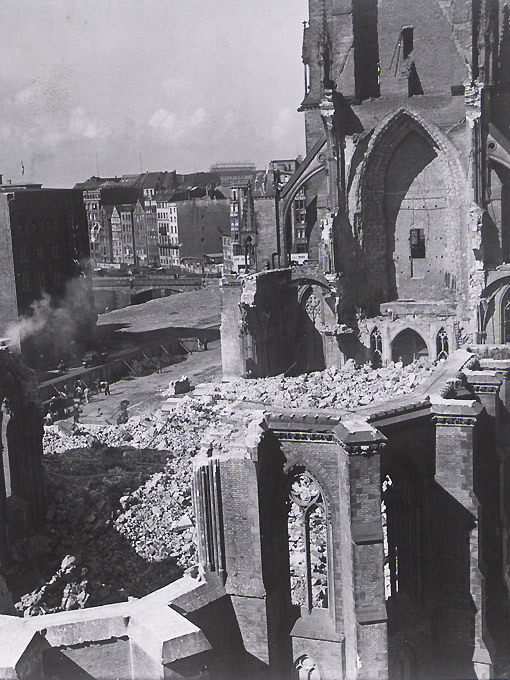 As early as 1951, however, the city government began blasting away remains of the walls. This process was called ‘post-blasting’. In many attempts the actually well-preserved choir was demolished down to the main cornice, and the transept and nave walls to the level of window sills. In regular intervals the discussion flared up as to whether or not a historical or at least a modernising reconstruction should be attempted. It was also suggested that St. Nikolai, this neo-Gothic Messkirche (with a nave aligned to the altar as in Catholic churches) should be handed over to the Catholics. However, the more time elapsed, the clearer it became that nobody was really interested in rebuilding this church and giving it to a parish. Unlike a hundred years before, this time a citizen’s movement in favour of the church failed to manifest itself. As a result, St. Nikolai was given up as a church building. In a correspondence between the Senate and the church even the term ‘final solution Nikolai’ was mentioned. This solution provided for the preservation of ruin and spire as a memorial. At first this was nothing more than an ‘embarrassment in the middle of Hamburg that had dropped out of the sky’. In the meantime, however, the St. Nikolai ruin has become a central place of commemoration for all of Hamburg’s citizens. This is mainly due to the civic commitment of a circle of friends and supporters of St. Nikolai. A permanent exhibition has been installed in the crypt; in addition, there are changing exhibitions and peace policy events. Services and ecumenical prayers are also held on a regular basis. So the remains of the church have at last found a new meaningful purpose. May - Sept. daily 10 a.m. - 6 p.m.
Oct. - April daily 10 a.m. - 5 p.m.